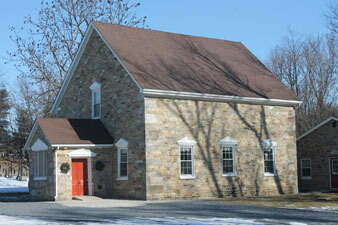 On March 19, 1760, Peter Apple deeded one acre of land; the land on which the church stands now; for a school. The school served as a church on Sundays and was visited occasionally by a circuit preacher. At other times, the school teacher led the services. Around 1765, on the same plot of ground a log church was built for the use of the Lutheran and Reformed congregation, which was organized on April 15, 1770. Services were conducted in German until 1830, when both English and German were used. Shortly thereafter, only English was spoken. In the year 1813, extensive repairs were made to the old log church. But as the congregation grew, it was decided to build a stone church. The cornerstone was laid on April 13, 1826. Most of the labor and materials were donated. Shortly after the new church was built, the old log church/schoolhouse was torn down. In 1857, the Lutherans announced their intention to move to Mechanicstown and build there, which they did the following year. The Reformed congregation decided to remain and the same year adopted a constitution as an independent organization. Later, the Reformed people, like the Lutherans, saw most of their members moving to Mechanicstown (today known as Thurmont). With this in mind, they built Trinity Church in 1879. Apples Church was used by the local residents until 1881 then closed its doors in 1885. In that year the people living near the church approached Rev. A. B. Stoner with the idea to clean and repair the church for a few summer services. This was so successful that the church remained open. In 1912, the church was extensively remodeled and in 1964, work began on a new educational building. Due to its historically important past, members today intend to save Peter Apples Church for future generations.